By the 1950’s Grandmaster Cheung Lai Chun was in his later years and had since retired from teaching. However a young teenager named Kwong Man Fong would come to change this. Fong had already been studying Pak Mei kung fu from a local teacher. One day an older friend of Fong’s, known as Hung Suk [Uncle Hung] learned of Fong’s interest in Pak Mei. Hung Suk happened to be friends with the system’s Grandmaster, Cheung Lai Chun and arranged for an introduction between the two. This meeting would come to change the course of Fong’s life. Upon the introduction, Master Cheung had asked Fong for a demonstration of what he’d learned. After Cheung’s laughter, Fong immediately realized all of his prior training had been in vain; referred to by Master Cheung as Hak Mei (a watered down version of the real system). He then proceeded to ask Master Cheung if he would accept him as a student – again, receiving a negative response. At this stage in his life, Master Cheung had no interest in taking on new students. However with a little convincing from Hung Suk, Cheung had a change of heart - but on one condition. Cheung gave Fong a task - if he were able to understand and properly execute one particular technique within the course of a few months, only then would he be accepted as a formal student. After constant training and analysis, Fong met Master Cheung a few months later, showed him what he had accomplished, and was officially accepted under Cheung Lai Chun's tutelage. Fong was not taught in a typical Mo Gwoon (kung fu training hall) setting. He would meet Master Cheung almost every day at his then-favorite tea house named Kei Heung on Shanghai St. It was at this tea house where Master Cheung opened Fong’s eyes to the intellectual, theoretical and historical aspects of The Art of Pak Mei. After yum cha (brunch) Master Cheung would then give Fong the times and locations for the coming week’s training sessions. He would typically meet his teacher at 5:30am at the campus park of the private high school in Mong Kok East, Kowloon. And on other days, they would sometimes resume training in the afternoon after Master Cheung's daily routine of bird fighting at Kei Heung. Fong knew he had found his calling. As soon as he had completed the Baai Si ceremony in Spring of 1960, he decided to leave school and dedicate his life to Pak Mei kung fu. He trained tirelessly and hung on every technique and every word spoken by his teacher. Master Cheung was surprised and pleased with Fong's progress and would often quote, “It is hard to find a good Sifu, but it is even more difficult to find a good Tou Dai”. As Cheung Lai Chun’s last and youngest disciple, Kwong Man Fong learned the proper system of Pak Mei kung fu prior to Cheung Lai Chun’s passing in 1964. Fong will always remember his promise to his Sifu; to honor the 'Pak Mei Creed' and to preserve the Art of Pak Mei as taught to him for future generations. Along with his sihing, Cheung Bing Fatt, Fong had honed his Pak Mei skills through constant practice and tested application via rooftop sparring and fights with local thugs. After arriving in New York in 1969, Fong had devoted a substantial amount of time to training; sometimes 8 to 10 hours per day. And finally in 1974, he opened his first public school on Christie Street in New York City’s Chinatown. Over the decades he has instructed many practitioners and has produced numerous victorious competitors, along with a handful of dedicated and trusted Tou Dai. Master Fong continues to be a staunch traditionalist, adhering to the standards established by the Pak Mei Creed. Over all his years, Master Kwong Man Fong has always maintained a very modest approach to his abilities; always focused - never blinded by pursuit of fame or reputation [reputations build themselves]. He is whole-heartedly devoted to the proper transmission of the art of Pak Mei kung fu precisely as it was passed to him by the late Grandmaster Cheung Lai Chun. As of 2012, the following 6th Generation disciples are recognized by Master Kwong Man Fong for understanding and honoring the Pak Mei Creed. To date, they are his only heirs whom have been tasked to carry on his lineage; representing the true teachings of Pak Mei kung fu as instructed by Grandmaster Cheung Lai Chun. Many students have trained for many years under our association, however very few have completed their training, achieved the level of "true" Sifu, and are permitted to teach under Master Fong's name. There are many whom have Baai Si'd under Master Kwong Man Fong that are still in excellent standing with our organization; there are also those that have Baai Si'd and abandoned their vows, thus dishonoring the Pak Mei Creed, their system and Sifu. The below in-door disciples have demonstrated unquestionable loyalty, perserverance, generosity, skill, and dedication. As such, they are the current carriers of Master Fong's lineage. Chan Sifu was born in mainland China and migrated to Hong Kong with his family in the mid-1950's. He initially studied Pak Mei in Hong Kong in the late 1950's, but relocated to New York City in the early 1960's. Chan Sifu performed the Baai Si ceremony in 1975 and is Master Fong’s most senior student. During a brief section of the 1980’s, when Master Fong relocated to the northwest USA, Sifu Chuck Chan became the principal overseer of the New York City school. Kwan Sifu was also born in mainland China. In order to escape the Communist reign, he swam to Hong Kong in late 1960's. While in Hong Kong, he learned a few different versions of Pak Mei; but when he came to New York City in the early 70's, he also decided to forget all prior Pak Mei teachings and became a disciple (Baai Si in 1975) of Master Kwong Man Fong. Kwan Sifu was the co-principal of the New York City school in the 1980's - alongside Chan Sifu. Wong Sifu started training at a very young age; a few months after Master K.M. Fong opened his first school on Christie Street. Upon joining, he didn’t know much about Pak Mei. But in a short period of time, he noticed that the school had effective techniques and chose to remain a devoted student. Master Fong’s classes in the 1970’s were very strict and often lasted over six hours. Sparring was particularly difficult for Edgar due to the significant age difference between he and his seniors. Wong Sifu performed the Baai Si ceremony in 1975 and despite a training hiatus in the 1980’s, he has always remained connected with the school. He has been responsible for running overall operations for the school since the mid-1990’s and following Master Fong’s retirement in 2011, the school was officially passed down to Sifu Edgar Wong. Kwong Sifu began training Pak Mei in the winter of 1979. He is one of Master KM Fong's most gifted students, whose first and only system studied was Pak Mei kung fu. Kwong Sifu performed the Baai Si ceremony in the early 1980's and currently assists Sifu Edgar Wong in all operations and instruction within the New York City branch. Cheung Sifu has an extremely diverse kung fu background, having trained in many different schools in the New York City area. Having lived across the street from Master Kwong Man Fong's Brooklyn location, he'd never entered the school until he accompanied his friend who wanted to observe a class. Having seen Master Fong and his students perform, he quickly realized ths system's effectiveness and decided to join. Cheung Sifu has proven his dedication to the organization on many levels both before and after he performed the traditional Baai Si ceremony in 1996. Tam Sifu was born and raised in the heart of NYC Chinatown during the late 1970’s and 80’. Living just around the block from Master Kwong Man Fong’s Kwoon, they were not yet destined to meet. Instead, Sifu Tam began his training within the NY Shaolin Longfist School under Sifu Henry Gong and Hei Gung/Acupuncture/Martial Strategy under Grandmaster Victor Lee; both a mentor and a teacher. After 10+ years of study, Sifu Tam eventually found his calling after a chance encounter with students of Master Kwong Man Fong. 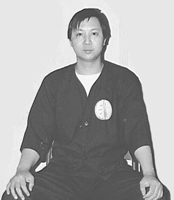 In 1998, Sifu Tam joined the Pak Mei group. In 2005, he performed the traditional Baai Si ceremony, dedicating his martial arts career to Pak Mei and the Pak Mei Creed, as passed down from Master K.M. Fong. Martin Sifu began formal martial arts training in 1984, has roughly twenty years of combined martial arts experience and has studied various systems within that time frame; primarily within the Chinese and Korean disciplines. After discovering Man Fong's Pak Mei kung fu in the winter of 2000, he quickly realized that this was the system & lineage he would devote his life to. He began training at Master Fong's Fulton St. location, performed the Baai Si ceremony in 2005, and began teaching publicly in 2009. His second-most passion [and closely-related discipline] since his early teens was drumming; and his only years spent away from martial arts were dedicated to music.